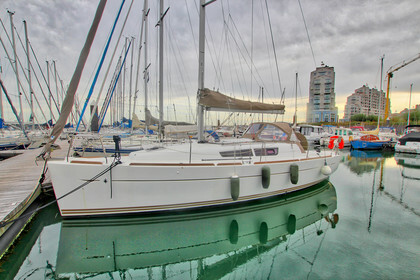 Price Drop: This Jeanneau Sun Odyssey 33i from 2012 is like new. It's full option. You will sit comfortably in the spacious cockpit and enjoy her easy handeling. reactive wheel steering, and having all sail handling functions within easy reach. Below, the inviting interior features quality trimmings. You will love her open, practical galley, a true chart table with full functionality, her comfortable and spacious saloon, and a fully equipped shower and head compartment. Each comfortable cabin features large hanging lockers and numerous portholes for a sea view.